Galley Wench Tales: Say What? Birdbrained Caption Contest. What are these seagulls saying or thinking? Write a caption, win a prize. The prize? Ummmm. Bragging rights? To get you started, here's what some of my Facebook friends had to say. My caption? "I am not worthy, oh Great Big Bird Poobah." My friend's are much better! By the way, does anyone know what these birds are? Dunno the answer myself, but they kind of look like they sport a short mohawk. They also seemed to behave this way (there was a clear "lead bird") when I saw them. A pecking order? Or? Theories welcome! 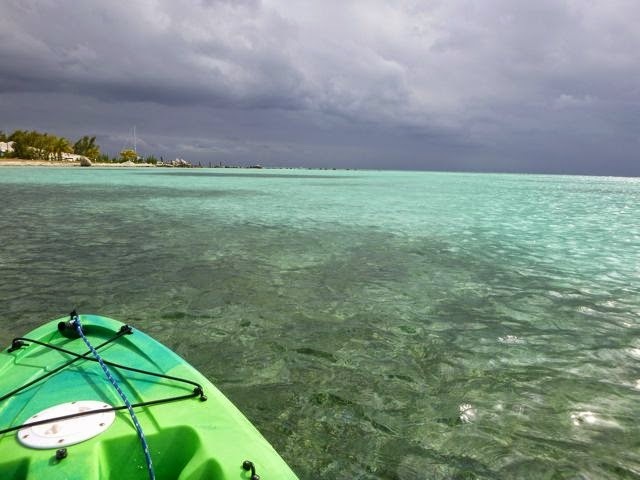 Recent retrospective from a kayaking jaunt April 10, 2014, Rum Cay, BAHAMAS (N23.38 W74.50). We’re temporarily landbound in Jacksonville, FL. We’re in the throes of planning our next big cruising adventure, to the South Pacific, where this Galley Wench is looking forward to a healed broken wrist and more kayaking trips. 4 more weeks 'til the doc says it's ok to hop on a bicycle. these birds are probably Royal terns, they have really cute hairdos and most shrilling cries. They are quite common in Caribbean, there are always some in Jolly Harbour, sitting on the channel markers with pelicans. There are quite several kinds of terns, we even have some here in Adriatic. Thanks Lili. You are the second person who suggested terns and I know you're a budding birder. In the States, I'd say those guys are wearing Mohawks! Just was figuring it was time to re-check your blog! Mom's caption suggestion: "Awww. This place is for the birds!"